An amphitheater full of eager fans awaits you. You run your comb through your perfectly quaffed, thick black hair. You straighten the collar on your shimmering white jumpsuit. You loosely toss a red scarf around your neck. It’s time to walk onto the stage and wow them… but something is missing. Sure, you’ve got those famous dance moves and you can gyrate those hips better than any musician out there. You can also do that lip curl move that knocks ‘em dead. You did your singing warm-ups. So then, what’s missing? We’ll tell you. It’s that indescribable aura of mystery. You need to hide a little something from the audience. You need to leave something to their imagination. You need sunglasses. Yes, sunglasses! Not just any sunglasses mind you, but the true shades of The King! 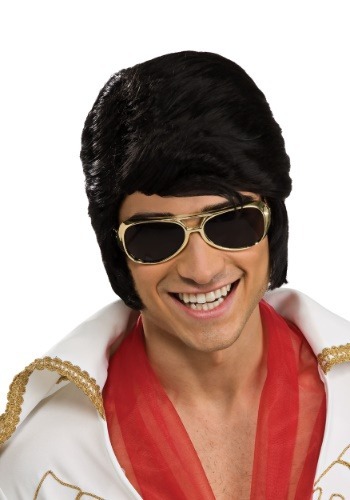 These Elvis sunglasses are designed to go perfectly with any of our matching Elvis costumes and they will certainly add that enigmatic air to your look! Whether you’re trying to impersonate the one and only Elvis Presley, or you just want a sweet pair of shades to make you feel like a rock and roll superstar, these sunglasses fit the bill quite nicely!